Striking where the enemy is weakest and melting away into the darkness before he can react. Never confronting a stronger force directly, but willing to use audacity and surprise to confound and demoralize an opponent. Operations driven by good intelligence, area knowledge, mobility, speed, firepower, and detailed planning and executed by a few specialists with indigenous warriors - this is unconventional warfare. T. E. Lawrence was one of the earliest practitioners of modern unconventional warfare. His tactics and strategies were used by men like Mao and Giap in their wars of liberation. Both kept Lawrence's Seven Pillars of Wisdom close at hand. This book looks at the creation of the HEDGEHOG force, the formation of armoured car sections and other units, and focuses the Hejaz Operations Staff, the Allied officers and men who took Lawrence's idea and prosecuted it against the Ottoman Turkish army assisting Field Marshal Allenby to achieve victory in 1918. Stejskal concludes with an examination of how HEDGEHOG has influenced special operations and unconventional warfare, including Field Marshal Wavell, the Long Range Desert Group, and David Stirling's SAS. Mr. Stejskal has done much the same by taking the story beyond Lawrence to include the men who did so much to achieve victory in 1918. Their remarkable story can be found here and you will not be disappointed with the telling. As Lawrence put it in his 27 Articles 'The Hejaz confounds ordinary tactics.' 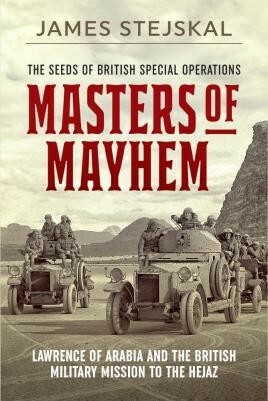 Masters of Mayhem provides an excellent basis for an understanding of why this was, and it, the case, and how the Allied forces at the time set about developing a new style of warfare to cope with it. … James Stejskal provide[s] excellent, authoritative source material that is as useful for intelligence and Special Operations practitioners as it is for historians of the Great Arab Revolt. this new work by James Stejskal offers an interesting and valid take on the campaign for whom Lawrence became such a talisman. … offer(s) plenty of quotes from Lawrence and details of his escapades.